A traditional Italian farmhouse with a courtyard, or cascina a corte, in the Italian Piemonte outside the town of Valenza. The owners swapped homes with the author for a week. Framed by a mountainous horizon, the farm fields are littered with hay bales, round and rectangular, and I'm reminded of the Virginia Piedmont, where I grew up. Such a gentle, pastoral landscape seems imprinted in my spiritual DNA, and it's the real reason I've journeyed to northern Italy's Piemonte region: to discover whether the two places have more than similar names in common. The shared name means "foot of the mountains." In the Virginia Piedmont, the mountains are the Blue Ridge. In the Piemonte, they're the much higher, less eroded, and therefore younger Alps, which on this hazy afternoon at this distance could even be mistaken for a chain in the Appalachians. 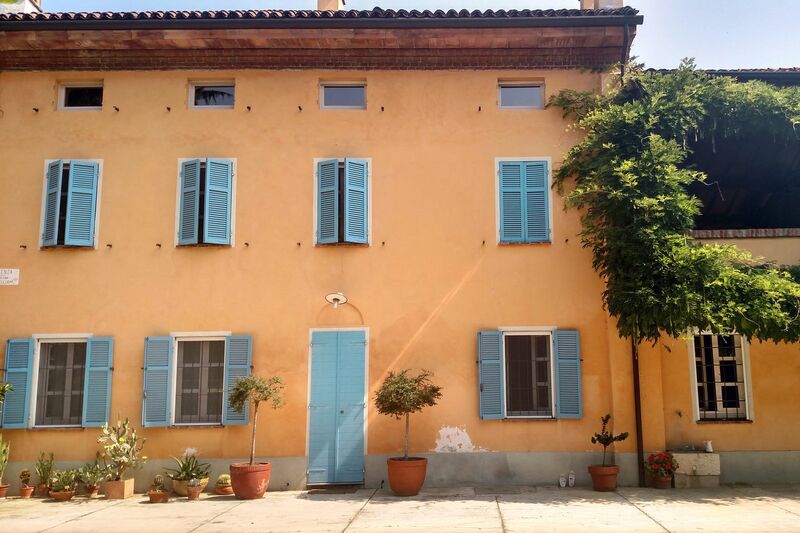 As my wife, Pat, and I settle into the first of seven days in "our very own" cascina a corte, I'm tempted to conclude that whimsy – such as seeking connections between the two – leads to the very best travel destinations. The traditional Italian farmhouse with a courtyard belongs to my newest best friend Massimo. Located in the countryside near the town of Valenza, in the Piemontese Monferrato region, it has been in his family for more than two centuries. Since he works and lives with his family in Milan, about an hour away by train or car, the cascina now serves as a second home. Strange as it may sound, it is through my own second home – in Maine's Mid Coast region – that Massimo's cascina now felt so comfortably familiar. He and I first met several months ago through an online community, HomeExchange.com, in which homeowners can arrange to swap dwellings on a temporary basis. As part of what has become known as the "sharing economy," it's different from a hotel or even Airbnb in a fundamental way: It's your house for mine. Perhaps even more important than the barter aspect is the qualitative difference in that you're getting not only a place to stay but also the opportunity to try on another lifestyle. In a foreigner's kitchen, cooking with their pots and pans, you have inexorably gone native. These rolling hills are typical of the Piemonte regions of Monferrato and Langhe, well-known for vineyards. So when the capricious notion to use my Virginia Piedmont roots as an excuse to travel to the Italian Piemonte first hit, I immediately clicked on a HomeExchange search. Of the several Northern Italian properties that interested me, Massimo's stood out. The trick was to interest him in my rustic Maine cabin an ocean away. As the HomeExchange platform facilitates direct messages between its members, it was easy for Massimo and me to volley questions and answers back and forth over the course of several days. But "closing the sale" required a more personal touch, so Massimo proposed a Skype conversation one Saturday from his kitchen table to mine. With him was his wife, Simone, and one of his two sons. Pat and I were joined by our dog Angel, who didn't seem to notice their cat Mina occasionally appearing on the computer screen. We must have chatted for at least a half-hour – our talk ranging from practical details about the proposed house swap to our personal and professional histories to recommended reading (novelist Cesare Pavese) for understanding the land and people of the Piemonte. By the time we said "arrivederci," it felt as if we were dear, old friends. On the day Pat and I arrive at the cascina, weeks later, this online friendship is reaffirmed by Massimo's warm welcome. He takes the day off from work to show us around not only the house itself but also the surrounding environs – including an in-depth history tour and where to find the best gelato. Massimo's charming, heavily accented English more than compensates for his American guests' lack of Italian. Still, I wonder if I understand him correctly when, upon opening his well-stocked wine cellar, he expresses the hope that we will help ourselves. That night, as dinner guests at the nearby home of Massimo's in-laws, Margherita and Ginetto, Pat and I are treated to a memorable introduction to Piemontese cuisine. Just hours earlier, the antipasto's multitude of vegetables had been gathered from their garden. The next morning, Pat and I awake to a combination of birdsong from the open window and the purring of Mina the cat nestled on the comforter at the foot of the bed. As we make breakfast from the yogurt, fruit and muesli that Massimo has thoughtfully left for us, we reread his five typewritten pages highlighting nearby attractions. The daunting number and range of enticing places to visit is such that the easiest thing to do, this very first day, is simply to settle in and enjoy the country house, its garden and farm fields, and the views all around it. We leave the cascina only once that day – to go grocery shopping at the village market. Over the next week, we use Massimo's bicycles to explore the Monferrato countryside and our rental car to venture as far as the Maritime and Ligurian Alps to the southwest. Wherever we go, I'm struck how the landscape, so similar to my native Virginia, is also profoundly different. It's all about the way the land is used. The mostly agricultural Piemonte has not surrendered much ground to residential or commercial "sprawl." Even the farmers themselves seldom have houses on the farmland; instead, they live in the quaint villages that punctuate the pastoral landscape. Viewing all the multicolored fields of wheat, fruit trees, corn, vineyards, even rice – unlike typical U.S. monoculture – makes it easy to understand why Piemonte is the birthplace of the Slow Food movement. Founded in 1986 by forerunner Arcigola in reaction to a McDonald's opening near the Spanish Steps in Rome, the now-global Slow Food (est. 1989) is headquartered in the Piemontese city of Bra. Agritourism venues that promote local foods and traditional gastronomy (including places to hunt truffles in the fall) abound in the Piemonte. But Slow Food also can mean slow traffic, as Pat and I often find our car stuck behind a tractor on the narrow country roads. The vineyards of the Monferrato and Langhe-Roero areas of Piemonte have been designated as a UNESCO World Heritage sites – meaning what the organization calls the "cultural landscapes" of these special places are worthy of preservation where humans interact with the natural environment in harmonious, sustainable, and aesthetically pleasing ways. The best known, justly praised wines here include Barolo and Barbaresco (sometimes compared to drinking velvet), made from the Nebbiolo grape. A few daring Virginia vineyards are now planting that grape, which would no doubt have pleased American wine pioneer and fellow Piedmont Virginian Thomas Jefferson. While serving as ambassador to France, the future third president made an inquisitive trip to Piemonte in the spring of 1787. To burn calories from the local cuisine – heavy on the wine and pasta – Pat and I make sure each day's excursion includes lots of walking. The most strenuous exercise entails hiking to the top of one of the nine Sacri Monti (Sacred Mountains), also recognized as a World Heritage site by the United Nations Educational, Scientific and Cultural Organization for their powerful admixture of landscape, art and history. These small, erosion-resistant mountains, standing conspicuously above their surroundings, are called monadnocks or inselbergs by geologists. Years ago, I built a small stone cabin on top of one in the Virginia Piedmont. Although my professed motivation was secular – a commanding view of the surrounding countryside – I can't discount subconscious spiritual yearning. As Pat and I climb the tree-lined, uphill switchbacks of the Sacro Monte di Crea, we stop at each chapel or sanctuary along the way – as much to catch our breath as to admire the architecture and artwork from the 16th and 17th centuries. Wall paintings and statuary commemorate the Christian faith’s foundational stories in a series of chapels leading to the top of Sacro Monte di Crea. It is one of nine Sacri Monti, or Sacred Mountains, in Northern Italy. Inside each are wall paintings and statuary commemorating the Christian faith's foundational stories, from the Nativity to the Last Supper. Atop the mountain is the Cappella del Paradiso (Paradise Chapel). For our last dinner in Italy, Pat and I get lost driving to a seemingly remote restaurant recommended by Massimo for its food in the Piemontese tradition. Once there, however, we quickly forget our frustration with "the Google Map Lady." The tasting menu includes Tomino cheese with honey and hazelnuts, a first course of agnolotti, a main course of veal shank prepared with Arneis, and panna cotta and pansy for dessert. What perhaps makes Piemonte seem most like home comes the next morning when we are preparing to leave the cascina. Unlike a hotel or Airbnb, there is no maid or cleaning service. Doing the dishes, putting things back in their place, emptying the trash; the time-consuming, oh-so-familiar chores are no different from those back home. Besides the simple courtesy of leaving things the way we found them, we have the practical incentive of knowing Massimo and his family will be visiting our place soon. And I'm already feeling guilty. Instead of a wine cellar under my rustic Maine cabin, Massimo may find a porcupine or a skunk. Unlike third-party websites such as TripAdvisor.com or Booking.com, which generate fees and commissions for themselves with each booking, HomeExchange operates more like a cooperative. Started in 1992, HomeExchange.com now boasts 65,000 members worldwide with over 1 million exchanges in more than 150 countries. Membership is $150 per year, allowing you to list your own property to be made available for exchange. You can then communicate directly with other members to propose exchanges, which don't have to happen simultaneously. The Piemonte, home to the Slow Food movement, offers endless dining opportunities: In even the smallest village is often a first-class restaurant featuring fresh ingredients and local dishes. A case in point is Locanda Dell'Arzente, where the tasting menu for two, plus a bottle of good local wine, averages about $81. This Michelin three-star restaurant is not inexpensive, averaging about $290 for a dinner menu. Enrico Crippa, the chef, has his own nearby farm that supplies the Fassona beef, hazelnuts, chestnuts, white truffles and biodynamic produce for his inventive modern Italian dishes. For guests who wish to spend the night, there are available three rooms (at about $290 each) and one suite (at about $522). For wine lovers, the Langhe section of the Piemonte region is known for its Nebbiolo grapes that produce distinctive wines considered among the world's best reds. There are around 300 vineyards producing Barolo and about 200 that produce Barbaresco. Travel Langhe specializes in custom, English-speaking tours; most cost about $240 per day per person.